Delivered online. Courses include lecture videos, activities and other media, accessed from NC State’s WolfWare website. Using online communication tools, students in these courses interact extensively with both the instructor and their peers. Delivered onsite. Courses include lectures in a class room. Students in these courses interact extensively with both the instructor and their peers. Courses have content delivered both in class and online. The online content delivery may occur synchronously (all students meet online at the same time) or asychronously (students log in to the course material on their own schedule). Face-to-face class meetings make up about 25% of the course hours. 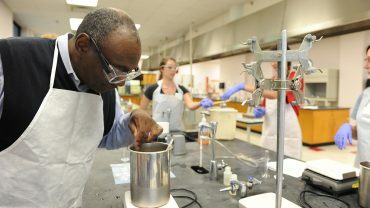 The Graduate Certificate in Nonwoven Science and Technology, offered by the Textiles Online Program of the College of Textiles, provides graduate students and non-degree graduate-level students the opportunity to develop recognized academic credentials and advanced expertise in Nonwoven Science and Technology. The 15-credit graduate program can be completed entirely online. An application form for the Graduate Certificate in Nonwoven Science and Technology is required. Applicants submit a resume identifying educational preparation and work experiences and official transcripts of all undergraduate and graduate coursework. Provisional Admission. Applicants who do not meet the GPA requirements may be admitted provisionally based on past work experiences as a professional in textiles or a textile-related field. Students who are admitted provisionally must earn at least a "B" average in the first three courses of the certificate program in order to obtain full admission to the certificate program. The student will receive a letter of approval upon program acceptance. Students prepare and submit a contract using the Certificate Contract Application prior to completing the first course after being accepted into the program. Students may begin taking courses for the certificate in Fall or Spring. This 15-credit graduate program includes five 3-credit graduate courses. At 2018-19 tuition rates, the cost of these courses is $453 per credit for North Carolina residents and $1,261 per credit for non-residents. Thus, the total estimated cost for the program is $6,795 for North Carolina residents and $18,915 for non-residents. See Online and Distance Education Tuition and Fees for cost details. Fifteen credit hours (5 courses) are required. Fiber web/nonwoven fabrics produced directly from fibers or their precursors. Physical and chemical nature of local bonding and fiber entanglement. Viable process for producing these fabrics. Economic justification for process and production. Product/process interaction. Plant visits whenever possible. Fundamentals of raw material used in nonwoven processes. Raw material production, chemical and physical properties of nonwoven raw materials and assessment of material properties. Introduction of structure/property relationships for these materials and how these relationships influence end use applications. Experimental results and theoretical considerations of physical properties of fibers and fiber-forming polymers. Electrical, thermal, optical, frictional and moisture properties of these materials. Influence of chemical and molecular fine structure on these properties. Mechanisms used in the production of nonwoven materials. Design and operation of these mechanisms. Process flow, optimization of process parameters, influence of process parameters on product properties. Fundamentals of fluid mechanics and heat transfer mechanisms during the bonding of nonwovens. In-depth description of hydroentangling, thermal bonding and needle punching techniques. Modeling methods and laboratory work are assigned. Fundamentals of methods used in evaluating properties and performance of nonwovens. Assessment of thermal, mechanical, moisture transport and barrier properties of nonwovens. Reliability and interpretation of test results. 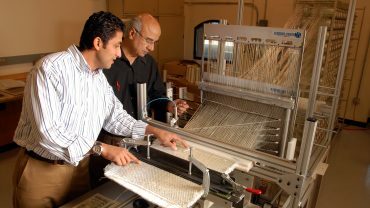 Fundamentals of nonwoven product development. In-depth knowledge of the materials, processes and nonwovens products. Design of a set of experiments intended for product development. Students work in teams to design, fabricate and evaluate nonwoven products. © 2019 NC State University Online and Distance Education. All rights reserved.